This set of jacket and leggings was donated to the Loeb collection as an Oneida man’s outfit. Its provenance has since been proven false. According to expert Dolores Elliot, “It shows no Oneida cultural traits. 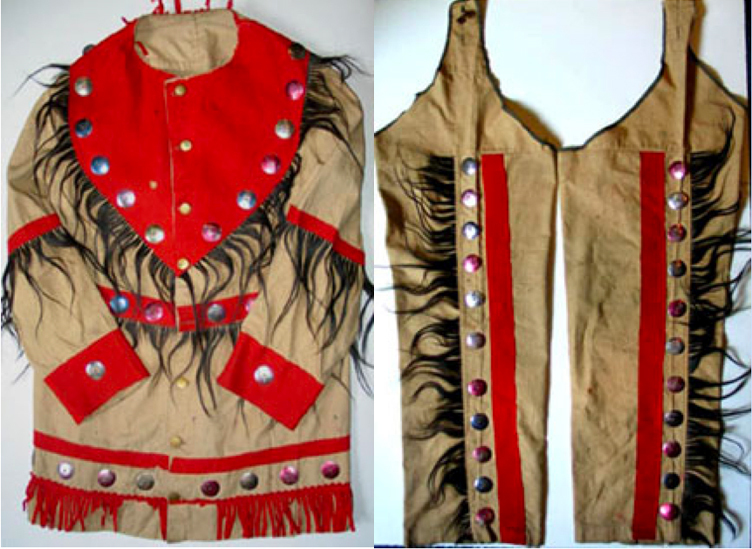 It could have been made and worn by just about anybody.” She posited it was a non-Native made costume used by a fraternal organization or a Wild West show. The museum and library director for the Improved Order of Red Men (IORM) identified the outfit, with ninety-nine percent certainty, as IORM regalia. The IORM, founded in 1834, is a fraternity whose mimicking of Native costume, nomenclature, and ritual was historically focused on preservation. One member said, “The value of the ceremonies of our Order is their historical accuracy. They seek not merely to imitate, but to preserve. When the time comes that the Indian race is extinct, our Order will occupy a place original and unique…and becoming at once, the interpreter of Indian customs and the repository of Indian traditions” (Quoted in Deloria 1998, 65-66). Today, the IORM is a philanthropic organization that promotes America and its ideals. This garment is a concrete example of how majority culture attempts to construct Native identity. The IORM member who wore it likely saw the tufts of horse hair as representing a spiritual connection with nature that he imagined Native Americans to possess. Although this garment is not an authentic Native object, nor has it in any way preserved Native culture, it still represents a crucial aspect of American history. It reminds us of America’s tendency to romanticize its indigenous peoples and even to borrow fantasized aspects of Native American identity.